This sculpture by Chris Brammall was designed and conceived as part of Derby’s £11.8 million Innovation Centre partnership with hi-tech engineering firms and academic experts. It offers innovation and mentoring support to aerospace, automotive and transport industries and is a significant move towards demonstrating the region’s position as the UK’s centre for transport engineering. The unique two-blade 18.5m sculpture sits at the heart of Infinity Park and is inspired by Derby industries. It took seven months and a team of four people to complete, it is made from stainless steel, weighs 11 tons and is finished to a bright reflective polish. "We believe the sculpture really captures the spirit of innovation and identifies with the work of planes, trains and auto-mobiles – which will be at the heart of the centre once complete. 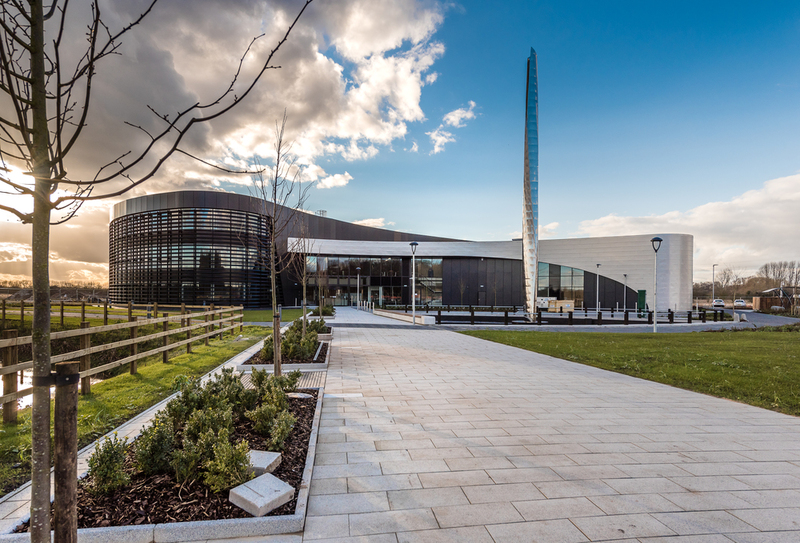 To have designed such a signature building with the eye-catching centre piece is something we’re really proud of." Andy Dowding, senior architect from Franklin Ellis Architects. Watch the project unfold with our fantastic time-lapse film on the Chris Brammall website.